The phone rang at work yesterday at about 1:00. My wife told me that a package had arrived from New York. 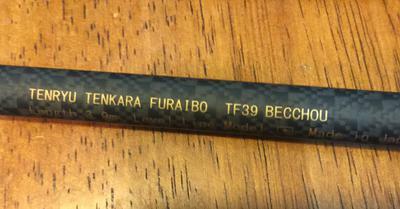 The long anticipated Tenryu Tenkara Furaibo Becchou had arrived. It turned into a long afternoon at work! As I carefully opened the box, waves of doubt hit me, "What if I don't like this rod?" I don't buy things to look at primarily. That said, I am an admirer of "Functional Art." I create functional art in my wood shop. When Chris first posted the opportunity to get this rare rod, I thought to myself, "If there is anyway I can swing this, I am going to get one." Unlike many who voiced their opinion on the forums, I thought the price was reasonable. The skill, labor, and time that went into not only making the rod, but the carbon cloth shines through in the final product. My new rod is named "Benelli." I had a very nice ultra-light 28 gauge Benelli semi-auto sitting in the gun safe collecting dust because I have another 28 that I shoot so much better. Selling it more than covered the price of the Becchou. When I pulled the rod out, I was stunned by the beauty of the weave in the rod case (picture 3). Tenyru spared no detail in this package! I opened the case and was greeted by a very nice cloth sleeve similar to what Suntech rods come in. I found the slot and pulled out the rod. My first thought was, "Wow, I really like the texture of the handle." (picture 2) Before I extended the rod, I played with various positions of`holding the rod. It feels really good in the hand! I then went out in the backyard and extended it. John Evans has commented on the fit of the Tenyru rod he owns. This rod is no different. Each section snugged up just perfect. In the sun, the weave of the cloth takes on an almost 3D effect. I false cast it a few times. My impression was that this is the most full flex rod I own. They have put water in the irrigation canals, so I got out my size 3 level line and a size 14 Kebari and headed the 200 feet to the nearest canal to do some casting. This rod not only looks good, it is silky smooth to cast. There was very little wind last evening, so I had ideal conditions. I picked out several smooth stones across the canal as targets. I was dropping the fly on every target after the first 5 casts. It didn't take long for this rod to feel like an extension of my arm. One of the reasons I like to practice cast on the canals is there are no fish. One of these days I am going to be surprised! It is moving water and simulates a stream pretty well. I am not sure when I am going to get out and fish it. I have decided that I am going to use a Kebari, and fish traditional Tenkara to catch my first fish with it. Sorry Red Wigglers. Indian Creek isn't blown out, so I may head down there tomorrow morning. I know this rod was expensive. I was shocked when Chris told me how few people took this rare opportunity to get a piece of functional art. I was also shocked at how much work Chris did so those who did take advantage could enjoy this rare opportunity. Chris does have the Tenryu Furaibo TF39 and TF39TA in stock. According to Chris the Becchou has a faster action than the standard rods. That is fine by me. So a BIG Thank You to Chris for working so hard to get us the best equipment out there. I wonder what unique rod will be next! Comments for The Wait is Over! Okay, Les, I'm waiting for a picture of the first fish taken with this lovely rod. Don't let it collect dust like the Benelli! Yes, the biggest difference I have seen in my Tenryu Furaibo is the fit and finish of the carbon fiber tubes. Not only is the rod beautiful, but the sections fit together smoothly and precisely. I have other fine rods and enjoy them all, but I would have to say that the carbon fiber sections on the TF are at the top of the list. Sweet Spot for each of my rods, and how wide is the Sweet Spot?" The only rod I was initially disappointed with when I got it was the Suntech Genryu Sawanobori 45. I went down to Marsing Pond to try it out on a very calm day. I caught one trout. It felt too stiff. As I put it away, the light went on and I remembered, "Hey I bought this rod for the wind." It blows in Idaho. Two weeks went by and I was fishing the TenkaraBum Traveler 44 when the wind began to howl and my rod tip was going everywhere. I pulled the Suntech Genryu Sawanobori 45 from my pack and salvaged the rest of my fishing session. I was rewarded with 3 nice trout. I say all of this because as I look at the rods I own, the Tenryu Tenkara Furaibo Becchou is my first "pure bred" Tenkara rod. Chris admits that the TenkaraBum 40 is a bit of a hybrid in its design. It is going to be interesting to figure out the sweet spot. This winter was spent working out the "Sweet Spot" with the TenkaraBum 40, the TenkaraBum Traveler 44, and the Genryu Sawanobori 45. Both of the TenkaraBum rods have a wide "Sweet Spot." I am finding the same is true of the Fine Power 56. So, I am looking forward to working out the "Sweet Spot" with the Tenryu Tenkara Furaibo Becchou. Several months ago, I re-read Chris' review of the Genryu Sawanobori. If you carefully read the reviews, you will have a good idea of the "Sweet Spot" of the rod before you buy it. Make sure you have the right rod for the water you are fishing. I would much prefer fighting the fish, than fighting the rod because I am pushing it beyond the Sweet Spot. Les, that is a very good way to look at rods. Many rods will function beyond their sweet spot, but they won't function well. Although I hadn't used those terms, that was really the basic idea behind the TenkaraBum 36. Fishing weighted nymphs, which almost everyone in the US does with their tenkara rods, is outside the sweet spot for a tenkara rod! Adam - It was a tough decision. Even though I feel that it was a reasonable price point for what you were getting, it is a lot of money. The standard Tenryu Furaibo TF39TA was tugging at my heart strings as well. At its price point, it wasn't near the leap to the Becchou. Value is in the eye of the beholder. It would be nice to hear a report on your zoom rod! What pushed me over more than anything is where I fish, 4 meters is about as short as I like. The Suntech FinePower 56 that zooms down to 52 has been an instant hit for where I fish most of the time. One of my commitments this year is to learn how to fish with Kebari flies. I now have a true Tenkara Rod. I have fished Kebari well with the TenkaraBum 40, and could have continue to pursue working on my proficiency. If I don't draw a Moose Tag this year, I am hoping to go to Oni Tenkara School.